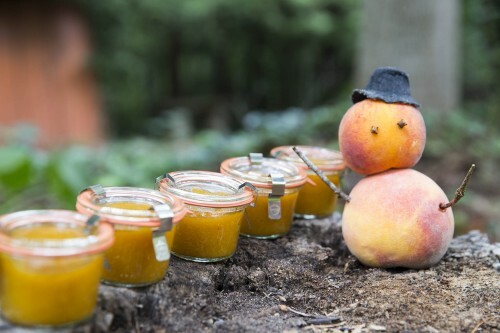 It’s a fine day for a walk in the woods with Mrs. Roasted Peach Butter and her five little “offspring.” Sweet late summer peaches are abundant here in the south, from giant to little and everything in between. 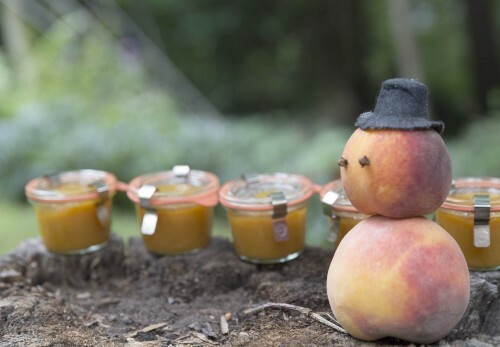 They’re ripening on counters, and not-ripening in the fridge and I thought I’d just gather a smattering of varieties and turn them into a fragrant low-added-sugar peach butter spread. Starting with 3 pounds of peaches, I added 1/2 cup sugar (about 100 grams) and juice of a couple lemons. The peaches were so sweet on their own, the modest amount of additional sugar just took over. Bleg. So I took out the stick blender, gave the hot mess a beating and then poured it into a big glass pan to bake in the oven. For an hour at 250º. Which turned into about three hours because I was playing with okra pickles … recipe testing for the picnic book at hand. Okra freaks me out, but okra pickles are so good and slimless enough once they sit for a couple weeks. 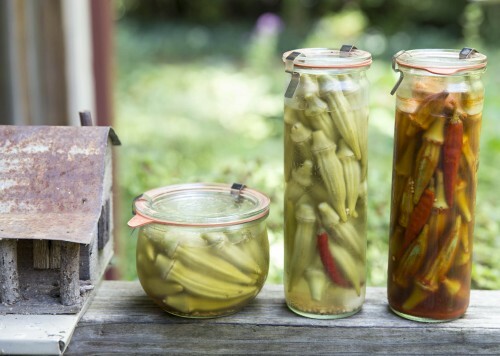 The super tall Weck asparagus jars make for some gorgeous smoky-okry and garlic dill okra pickles. Anyway, the “forgotten” roasted peach butter was so so SO much improved, that I’m going to forget it from now on. The color is deep and seductive and the flavor is frankly, stunning. It’s too good to eat with anything other than a little espresso spoon. There was just enough for 7 three-ounce Weck jam jars. So I promptly ate one and a half and water-bath processed the other five. Good thing Mama peach is guarding her babies! Peel peaches by giving them a 30 second bath in boiling water. The skins will slip right off. Remove & compost the pit and chop the flesh. 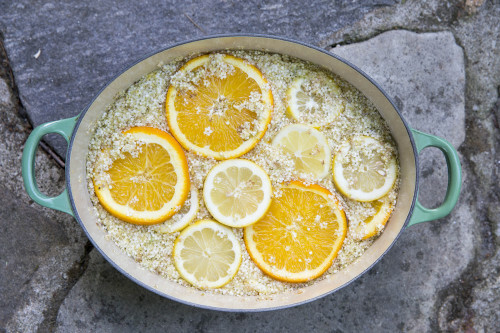 Place in a saucepan with 1/2 cup sugar and the juice of 2 lemons* Simmer the fruit on low heat for about 30 minutes, or until the fruit starts to fall apart. Give the hot pulp a toss with a stick blender, food processor or blender. Oh do be careful with splattering! Some like their fruit butters super smooth, but I prefer mine with some texture. You decide for yourself. Pour the fruit batter into a glass baking pan and bake at 250º for three hours or until it cooks down to a deep golden hue. It's ready whenever you think it is. 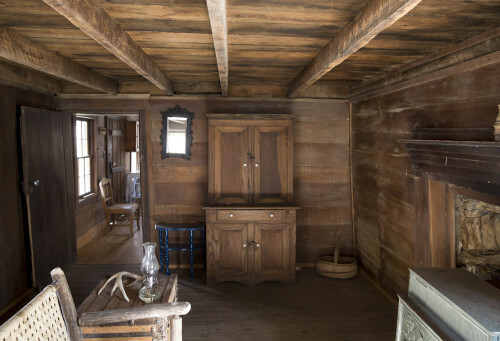 Water-bath can according to recommendations of folks like those at the National Center for Home Preservation. 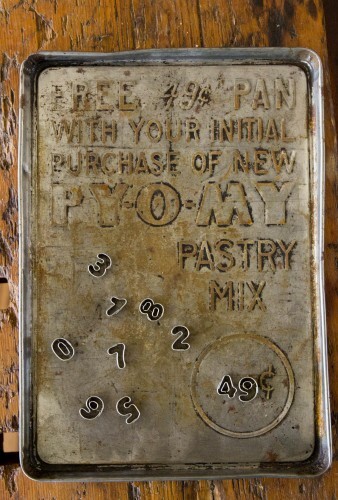 http://nchfp.uga.edu/publications/publications_usda.html Or, just get out a little sugar spoon and go to town. If using organic lemons for the juice, be sure to zest them first. 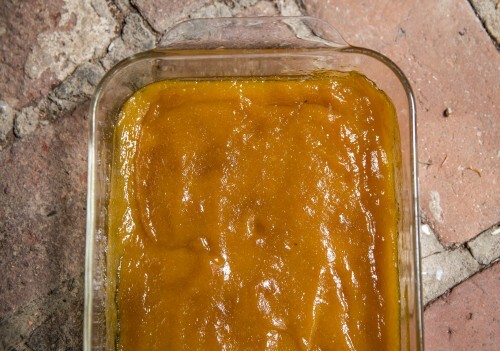 Citrus zest keeps perfectly in a small glass jar in your freezer for later use. 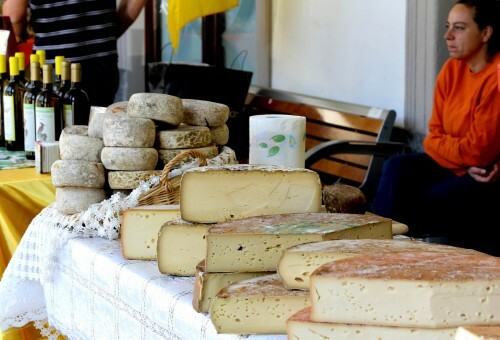 If you Asheville folks have a hankering to learn to make artisan farmhouse cheeses from local cow (or goat) milk, do we have a fun evening in store for you! My daughter Annie Erbsen De Bacco will be teaching a class on Wed., July 16th, and she knows a thing or two about the subject. 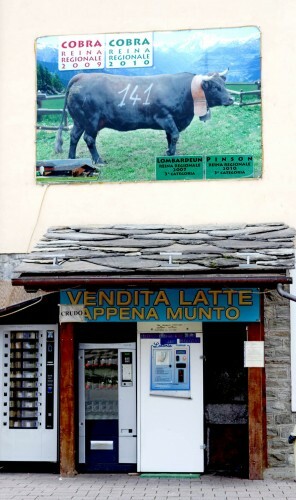 After all, she has spent the last 5 years living with her husband, Gianluca, next door to the roadside “cow vending machine” (photo above) in the alpine village of Aosta, Italy. 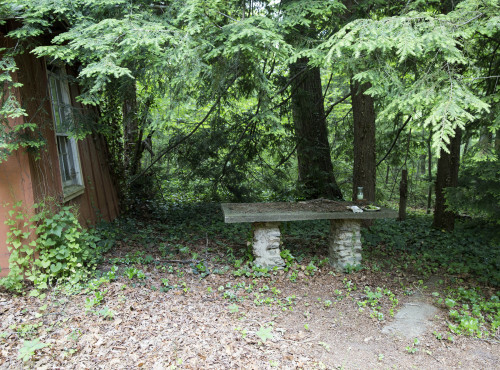 The Latteria sits on the side of a narrow road on the edge of a cow pasture. 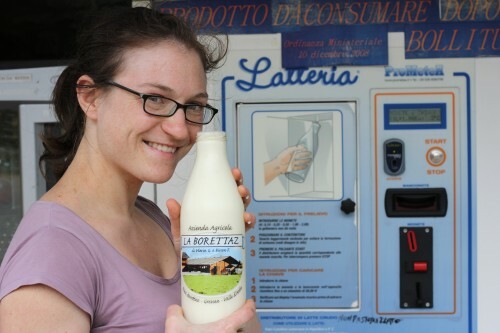 Drive or walk up, insert a Euro into the machine, and out comes a quart of fresh, raw cow’s milk. 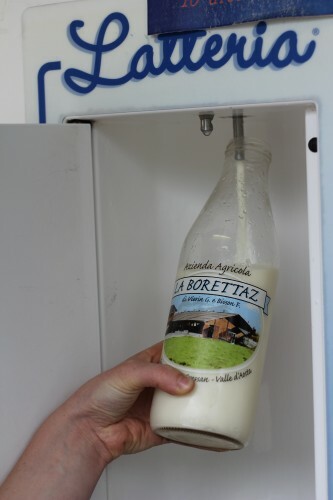 Not only can you get fresh milk from cows that are mooing a mere few feet away, you can also choose from fresh fontina, yogurt, or butter from the cow-automat just to the left of the milk dispenser. 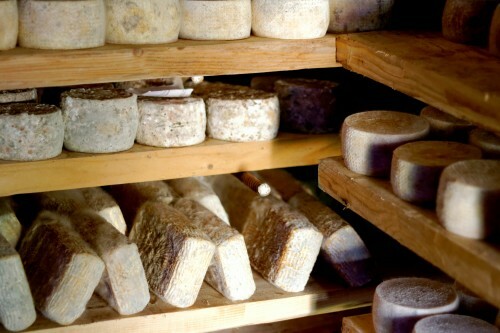 Made, of course, in the cheese kitchen within a stone’s throw of the barn. And that’s not all … see that cow at the top of the page? Well that’s sweet Cobra-the-cow who is pretty much, the most famous cow in the valley d’Aoste for being the cow battle champion several years in a row. Cobra lives in the cow vending machine barn and you get to drink her milk for mere pennies. Annie learned to make all sorts of fresh and aged cheeses from Roberta … who lives at the top of an alp with her family … and makes the most amazing cheeses from her cows and goats ever … And here Annie learns from a cheesmaker from Branzi, only a 30 minute blood-curdling mountain road drive from another well-known cheese town of Taleggio. 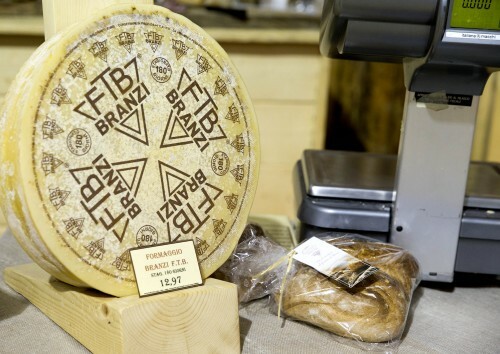 You will not get to eat the fabulous, creamy, famous Branzi cheese of this cheesemaker. 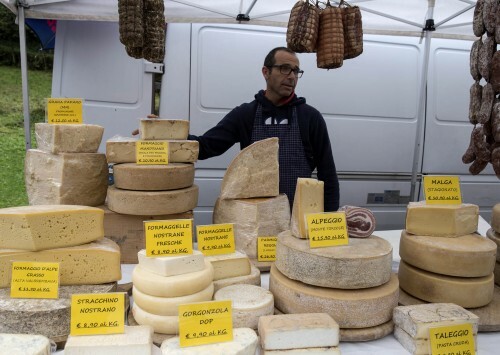 Or any of these other versions of cheeses you might have heard of …. 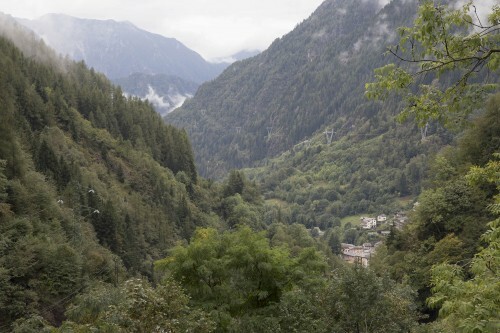 Unless you travel to the upper Val Brembana in the Bergamo region of northern Italy where Branzi and its neighboring cheeses are born. There is precious little of them and they are consumed where they grow. Which brings us to what grows in the mountain region around Asheville, and that is plenty of good milk, both cow and goat. 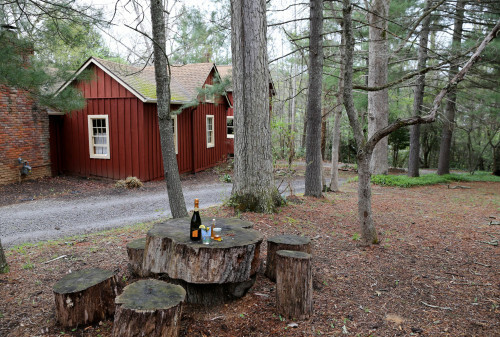 And, in fact, Western North Carolina has abundant small batch artisan cheesemakers and its very own cheese trail now. 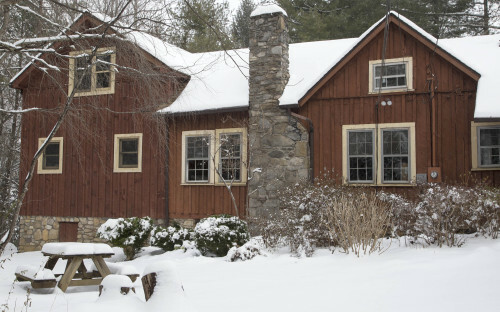 Annie will source local, low-temperature pasteurized cow’s milk (and maybe goat as well) for her class, and participants will learn to make fresh mozzarella, ricotta, and fromage blanc cheeses. 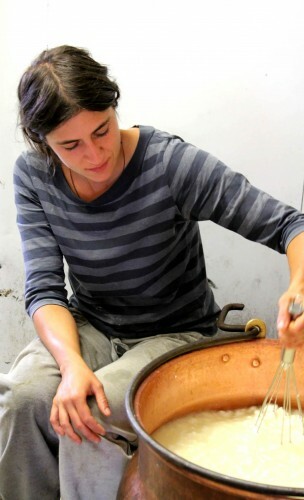 She’ll also discuss how to work with raw milk in case you have access. To register, go to the classes page and we’ll see you next week! PS: Do not procrastinate signing up; the last class Annie taught filled up in 2 hours! Ugg. Somewhere due east of remorse is regret. And I have it bad. But at least I didn’t dawdle away the chance to make three fetching early summer flavorings in the aftermath. 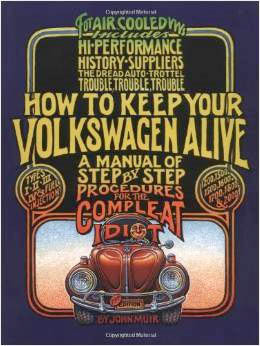 And I hope you don’t dally either, if you have any of these in mind to make. Before I tell you what they are, here’s my regret confession …. This was at a yard sale last weekend and I did not bring it home. 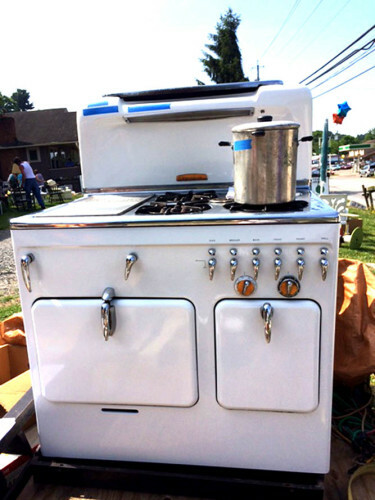 But now I’m sorry because I’ve been looking for a vintage stove like this for years and years. It’s a trivial regret, to be sure. But to be a pussyfooter, which is a real word, by the way, is to be cautious in a “don’t dance in the rain, you’ll catch a cold” sort of a way. No thank you to that. Lesson learned, let’s make Maraschino sour cherries. 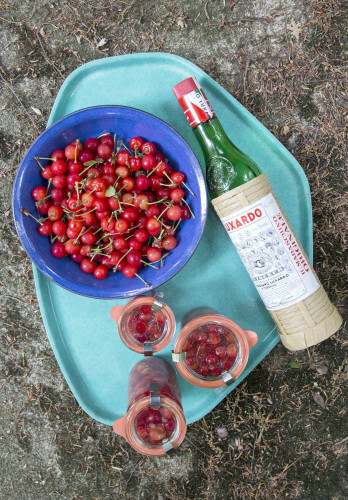 You’ll need a bit of Luxardo Maraschino liqueur, a slightly bitter, sweetened cherry liqueur. Mind you, Luxardo = luxury = pricey. But at least it’s a huge bottle for $35. Brandied cherries are wonderful as well. Anyway, pit fresh sour cherries such as Montmorency or whatever kind you can find at your local farm market and place them in a pretty jar. 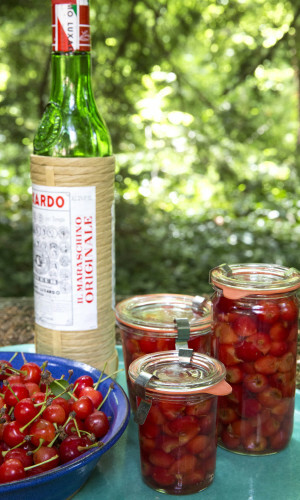 Warm up about a third of the amount of liqueur as you have cherries … don’t boil, just warm. Pour over the cherries and refrigerate. If using brandy, dissolve sugar to taste to the warm brandy and add to the cherries. Now on to #2: Garlic scapes. The little twisty seed stalks of hard-neck garlic are ready and available in your garden or at farm stands right NOW, depending on where you live. You have some time if you live in the North. 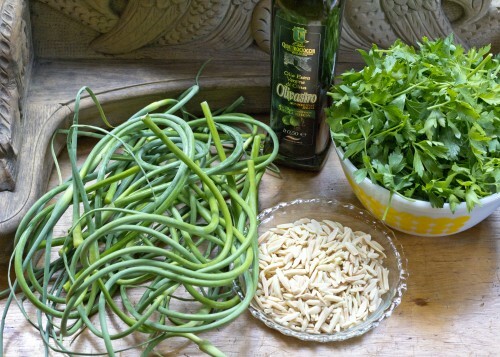 You can read about garlic scape pesto here, but all you need to do is buy about 5 or 10 bunches of them (usually around $1.50 a bunch), if you don’t grow your own, and just store them in the fridge in an open bag. They’ll be good until August. They will change your life. On to the most urgent of the three non-regrettable summer pantry items: Elderflower cordial. 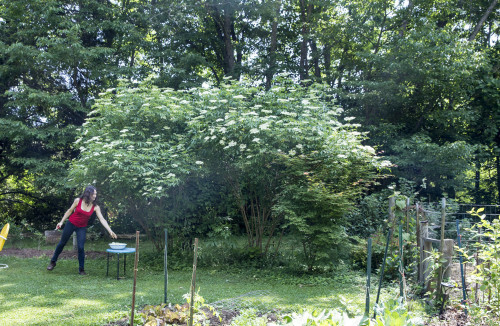 We planted two varieties of “bought” elderflowers which have just about finished blooming. York and Nova. And the native wild bushes are in flower TODAY here in Asheville. Elderflowers smell like happy. So sweet and seductive. 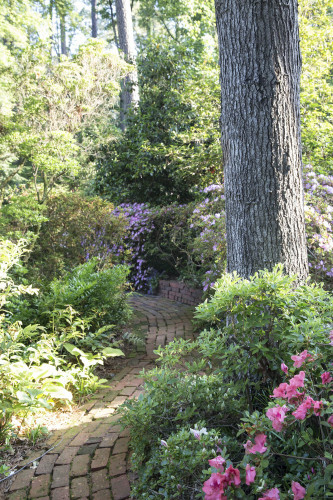 The fragrance of the blossoms and of all they infuse is subtle, yet memorable and so fresh. Like that summer rain we’re going to dance in. Pluck the flowers off with a fork straight away, the blossoms will not wait. All parts of the plant but the flowers and berries are toxic. So do as you’re told, dear. You can make a syrup out of the flowers, which will keep in the fridge a couple weeks, or you can freeze in ice cube trays. Store the cubes in jars. 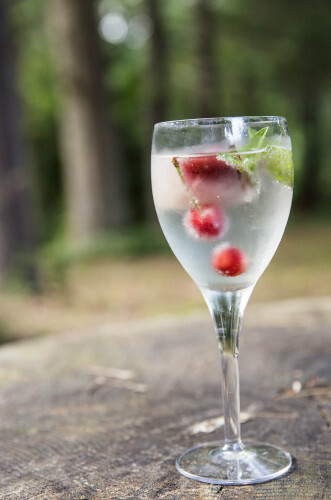 Into fizzy water, prosecco, or rhubarb mojitos they go, with a few fresh berries and mint. Here’s a prosecco, elderflower cordial/strawberry ice cube, and maraschino cherry fizz. 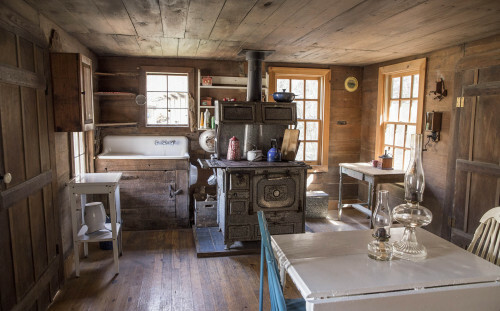 Maybe, just maybe … almost as good as a 1953 Chambers gas stove. 1/2 cup sugar for light syrup. Up to 2 cups sugar for heavier syrup. First make absolutely positive that you have identified correctly your elderflower bush. 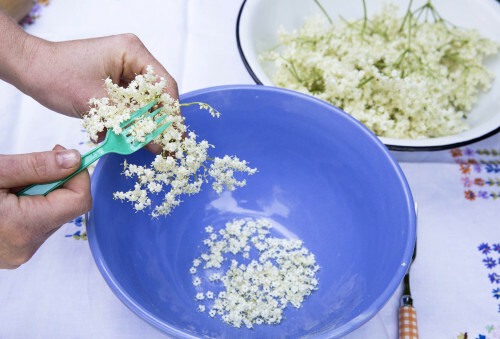 Pluck off the blossoms of 15 freshly picked flower heads with a fork. You should have about 2 cups. Pick out any green stems while you prepare your sugar syrup. Boil water and sugar until sugar dissolves. Then add lemon and orange slices and citric acid if you're using it. (See note below.) Allow the syrup to cool a little. It should be warm but not super hot. Add the flowers and place all in very clean jar. 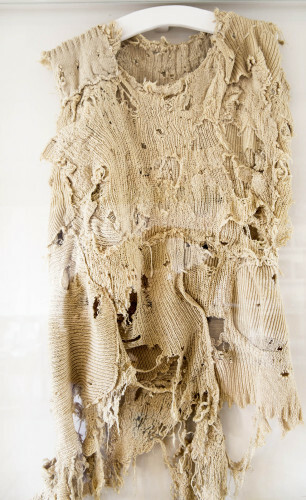 Sit at room temperature for 24 hours and strain off flowers through cheesecloth. 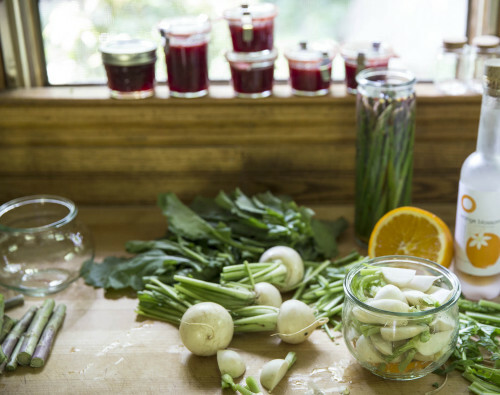 Store in a sterilized pint jar in the refrigerator for two weeks, or freeze to plop into summer beverages. 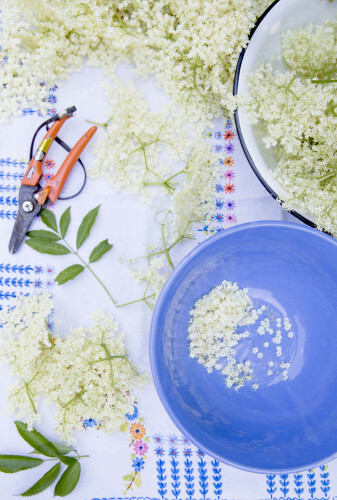 Most elderflower cordial recipes call for the use of citric acid. This will keep the cordial from going funky for about 4 weeks or so, but I'm not a fan of the taste of it. So I just freeze mine, sometimes with a strawberry in the middle. You can also make an alcoholic version by stuffing a jar with blossoms, filling with vodka, and then placing lemon slices over all. Strain after a few days or up to a week. Sweeten to taste with sugar syrup (two parts sugar dissolved in one part boiling water, then cooled). Are you playing with your vegetables again? I hope so. 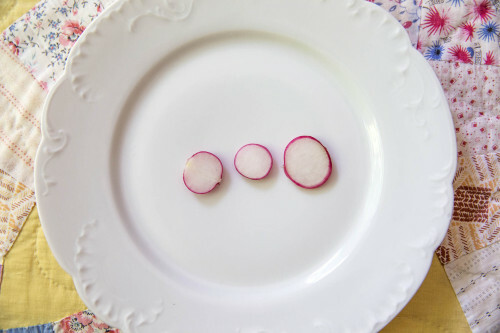 Otherwise, you’ll have to explain yourself to these radishes in need of a hair-do. Fresh-plucked spring veggies are just so darn fun, all you have to do is get out of the way and let them party on your plate. I just read a recipe that instructs: Split a vanilla bean in half, scrape out the seeds and discard the bean. WHAT???????? Are you crazy, at about $5 a bean, there are a gazillion things you can do with a eviscerated vanilla bean pod, the least of which is stick it in your sugar bowl until you can figure out how to use it. Anyway, I got to thinking about how people forget that the stems and leaves of garden-fresh beets, turnips, and radishes are edible and delicious. (Not strawberry leaves or stems. Don’t eat them!) Carrot stems are edible but an acquired taste. Leaving a little bit of stem on your wee veggies makes them look like themselves too; so much more festive at the table. I’m in the pickle phase of my book, and out of all my recent trials, the turnip stems in homemade muscat wine vinegar is my favorite. 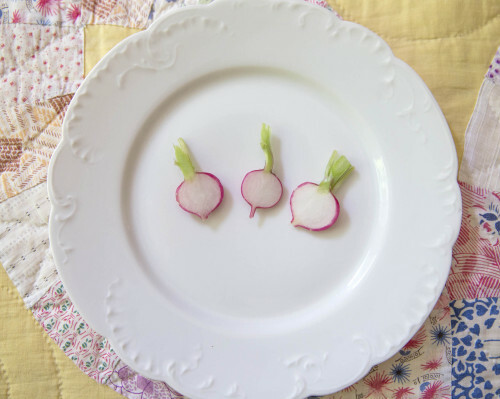 The pickled turnip stem idea was not mine, it was Hugh Acheson’s. The recipes in his new book are quite wonderful, even though you have to cut the dern book apart to be able to use it. I didn’t photograph the stem pickles, because who knew they’d turn out to be the Cinderella pickle! 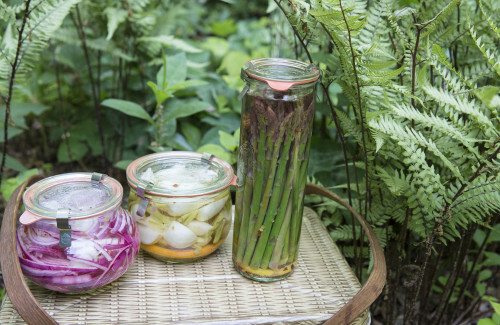 Below are red onion and cardamom, asparagus spear, and baby turnip/orange pickles. See that fern to the right of the asparagus pickles? Well, that’s a strikingly beautiful Ghost fern which you can purchase anyplace that ferns are sold. This one is a piece of the original mamma of all Ghost ferns which spontaneously appeared in the garden of my very own mamma (and dad). 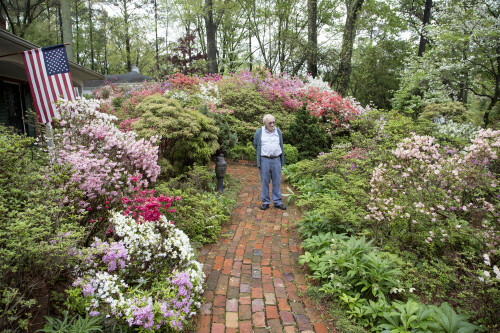 Which is a sweet story for another time, but let me just say that I was just in Richmond VA, visiting my dad and the garden he and my mom created, which is actually more like a park. He tends it on his own now, and it is magnificent. As is my dad. 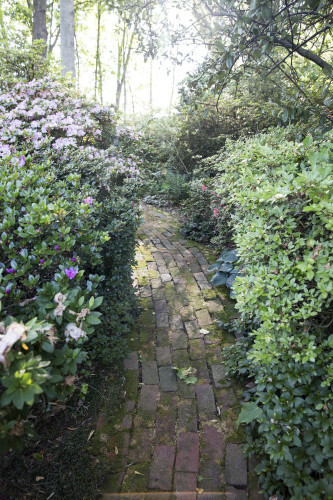 Everywhere you look flanking the maze of antique brick pathways are native woodland plants loving collected, traded, and shared over a lifetime. 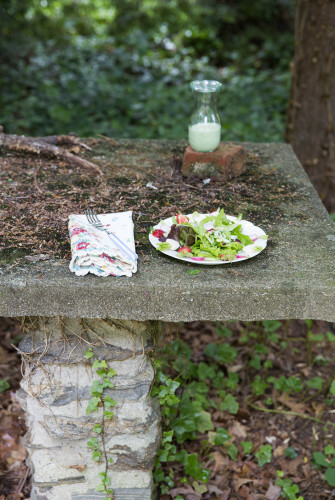 Which brings me back to spring offal salads that look like themselves … and this project waiting to be tackled in this forlorn forgotten corner of our yard: The abandoned concrete and stone picnic table from the 1940’s when our stucco barn of an 1880 house was resurrected. See that slab of concrete on the ground to the right? That’s one of the benches. By the end of the summer, it will be sitting on stone pillars waiting for alfresco diners like you and me. The old red goat house that’s now a facade will have to wait its turn. PS: “Offal” is technically something that is wasted, but these days, it’s typically used to refer to animal innards like kidneys and livers, that are again a welcome guest at many a omnivorous table. Cut baby veggies in half, leaving a little of pointy root end and a bit of stem. 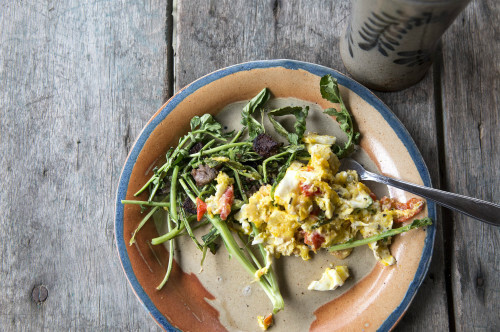 Save turnip, beet, and radish greens for another meal. Place the veggies around the edge of the salad. 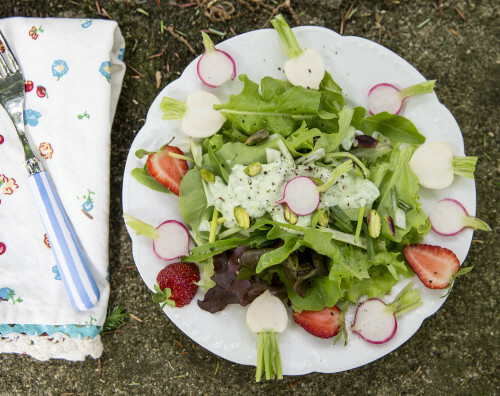 Top salad with buttermilk/fresh herb dressing, and sprinkle with pistachios. 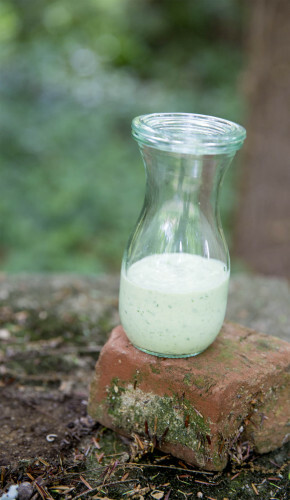 Into your blender or food processor, place one cup good buttermilk, 2 Tbs. sour cream or greek yogurt, a smushed clove of garlic, a handful of fresh herbs (parsley, basil, tarragon, chives, green onion tops), half an avocado if you have one, a squirt of lemon juice and salt and pepper to taste. Blend until it looks the way you like. Can use as a dressing or a dip. There’s a dandelion emergency pending, ya’ll. Our cheery yellow polka-dot pals are about to get the perkiness froze straight out of them tonight here in the mountains. So I suggest you run outside and pick as many as you can, just in case, because you don’t want to miss a chance to make this spritz. I have a recipe in my Garden Supper Tonight book for Dandelion Honey, which I learned from our Bohemian friends, Martin and Denisa. 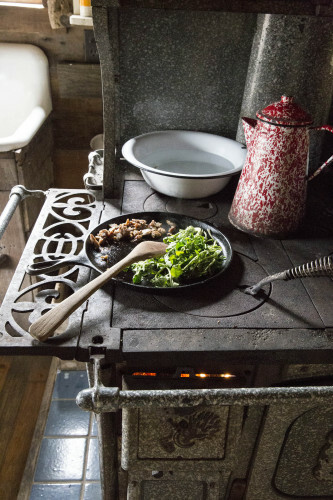 They live in a little village just north of Prague with their two kids in a fairy-tale cottage that sits on the edge of a forest that is enchanted with wild edible mushrooms. 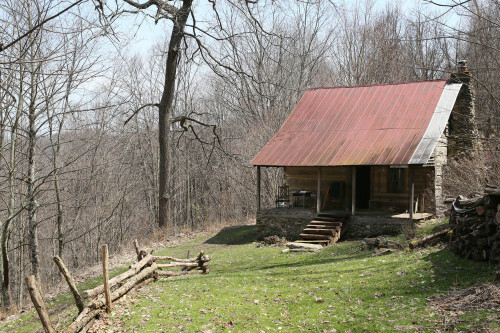 Martin plays, teaches, writes books about American Appalachian old-time music … in the Czech Republic. Listen to him play the banjo here to get you in a dandelion mood. 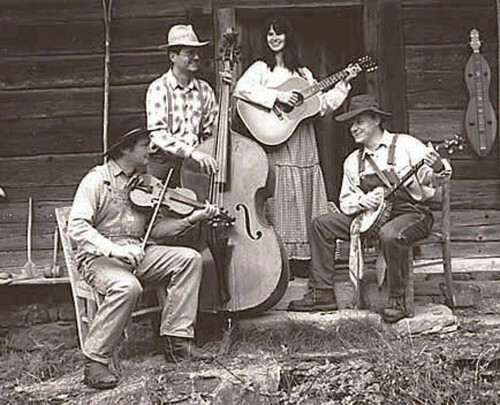 In the photo below, he’s on the right playing his banjo and Denisa is playing the guitar. I could talk forever about this wonderful and talented family, but we need to get our dandelions tended to. 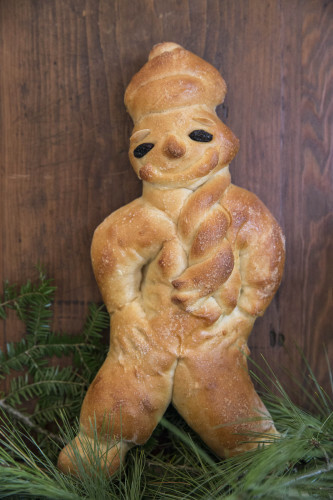 “This is a traditional recipe passed down from the old-world Europeans. We use it as a substitute for honey in any recipe that I’m trying to make wild.” What Martin means is that this delicate floral-flavored syrup tastes of the outdoors … an unmowed yard teeming with dandelions and wild violets, morel mushrooms laying in ambush in the woods, and cherry blossom petals swirling in the breeze, which by the way is a bone-chilling breeze at the moment. 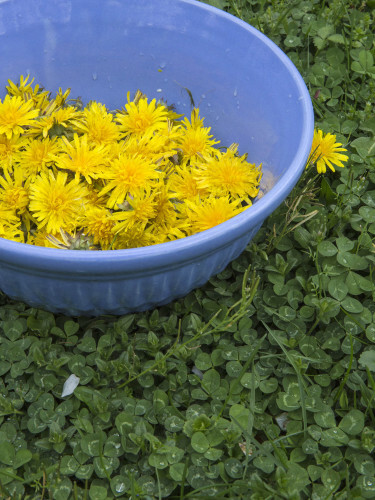 To make the Dandelion syrup, you pick as many flower-heads as you can 100-200 is a good amount at a time. There are about 150 in this bowl. Pinch the flowers out of the green lower leaves, and measure out the petals only. Don’t worry if you get some green leaves in with the petals. “They” say these will make your syrup bitter, but a little bitter is the taste of spring and it goes perfectly with a Prosecco spritz. The recipe particulars are below, but basically you infuse water with the petals overnight, strain in the morning, add sugar and reduce liquid by half. You can simmer it super slowly like Martin suggests, in order to keep the color pale; or you can do as impatient Barbara does and boil the heck out of it for 30 minutes and it’s light amber. Slow cook it if you want it to be the color of honey. A spritz doesn’t care as long as it’s not scorched. The syrup will keep refrigerated for at least a couple of weeks. To keep for longer, make into ice cubes, which you can remove from freezer and plunk into your summer drinks. To make an alcoholic dandelion honey cordial, add a cup of vodka to every cup of cooled syrup. This will keep indefinitely in the refrigerator. To make your spritz, pop open a bottle of chilled Prosecco, Cava, dry white wine, or fizzy water. Add a tablespoon or so of dandelion cordial to each glass, top with Prosecco, lemon wedge, a dandelion or mint spring and keep your fingers crossed that our fruit trees don’t get frostbit! 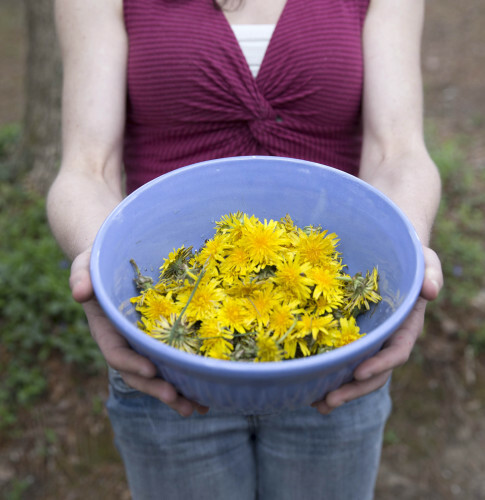 Boil the water, stir in the dandelion petals, then turn off heat. Add the juice of the lemon and throw in the shell. Pour cooled mixture into a quart jar and refrigerate overnight. Next day, strain out the dandelion parts and to each cup of liquid, add a half-cup of sugar. Simmer until reduced by half. At this point it will start to bubble like crazy, stop at this point, or you will scorch your syrup. 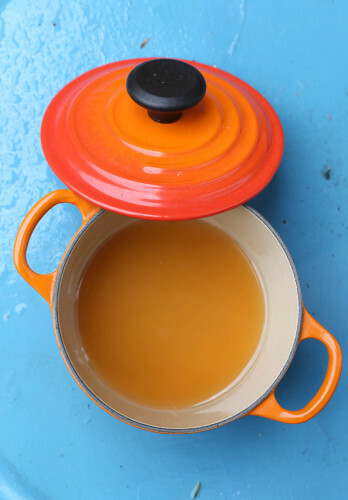 Pour syrup into a dish-washed or sterilized jar. 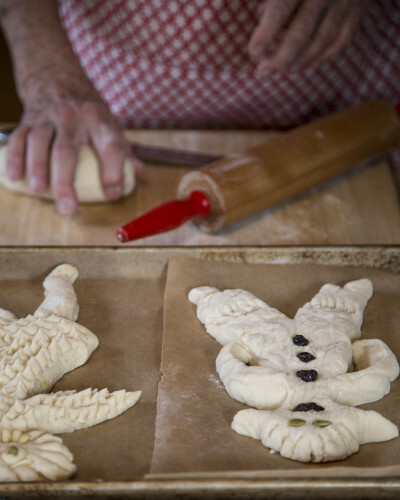 Keep in the fridge up to two weeks or freeze into separate ice cubes. 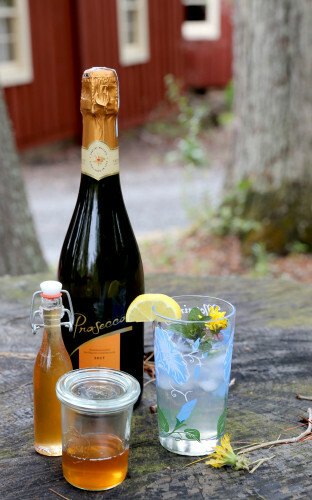 To make a Prosecco spritz, add a tablespoon of dandelion blossom honey to each glass of prosecco or other white wine or seltzer. 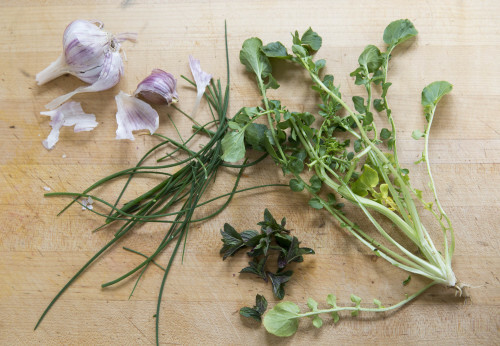 Garnish with lemon, bug-free dandelions, and a mint sprig. Creasy greens! And a wild violet and creasy spring salad. If you look down, Spring has arrived in our mountains. 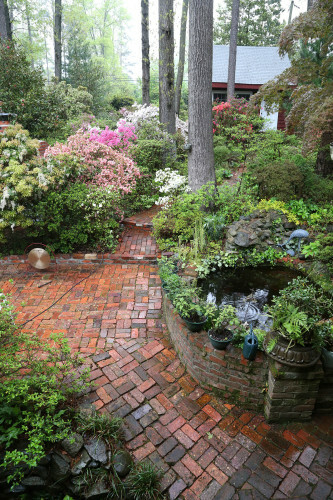 If you look up, Spring looks like it’s a million years away. 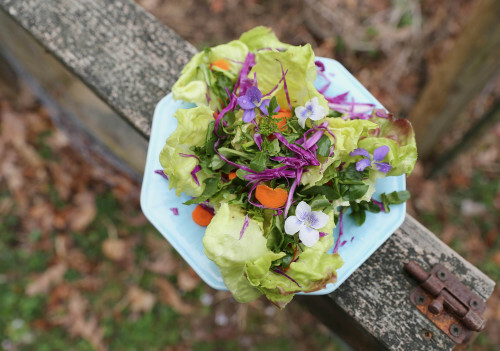 But when the creasy greens start popping up in fields and roadside stands here in Western NC (usually mid March), eating officially gets pretty darned exciting. In case you don’t know these slightly bitter, pungent, heavenly greens, you might want to order some seeds from here and plant them post haste. What we call creasy greens are actually upland cress …. watercress’s landlubber cousin. Only more of everything including vitamins and chew. I only have one patch in my garden, so I picked up a bagful at a farm stand en route to our cabin this week. We ate them pan-seared with eggs and sausage for breakfast. Then, we had enough energy to do some spring cleaning inside and out. 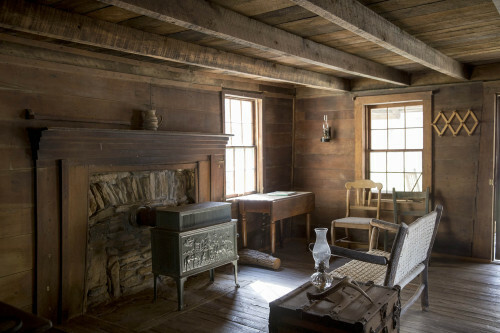 It’s easy to clean when there’s no stuff. And it’s too dark to see into the nether-regions. No electricity = no vacuuming, just a broom and a mop. 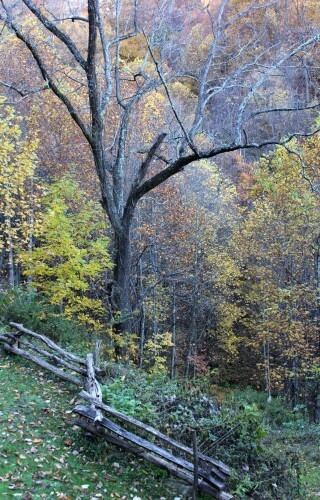 And then once back home in Asheville, the creasy’s screamed SALAD!!! 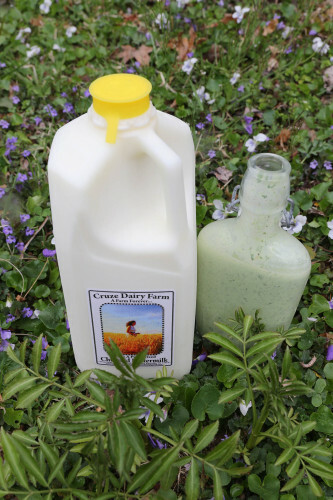 Usually I’m not much of a salad dressing fan, but there’s nothing like a fresh-tasting creasy green and teensy green herb buttermilk salad dressing to top a spring green salad. Right in front of the salad dressing and buttermilk are several baby elderberry plants which need a home. Who wants them? 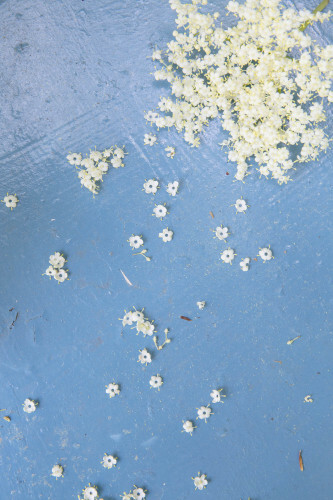 The variety is either a York or a Nova (not sure which plant they sprung from) and they will bless you with fragrant elderflowers for your summer cordials and cakes and deep blue-black berries that will strengthen your innards. You’ll have a crop next summer. They need lots of room and nothing else. Except you. Add all to blender and whirl. Adjust the salt and pepper to your liking. 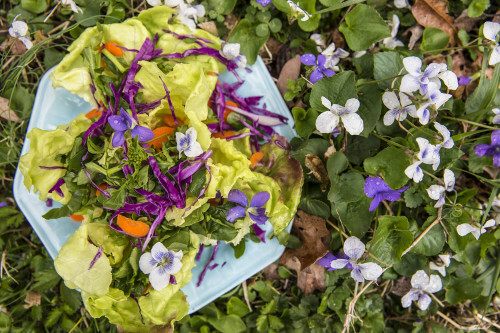 Drizzle over a fresh spring salad of crunchy bibb lettuce with red cabbage, chopped creasy greens and carrots. Don't junk up this salad! 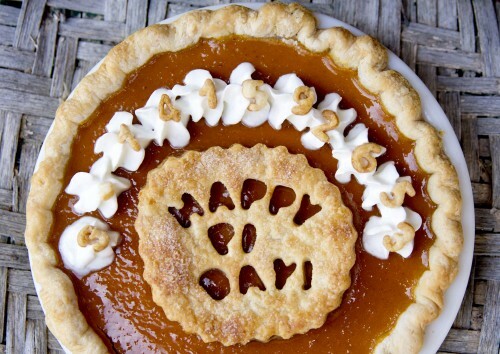 I baked you a pi for your birthday, Albert Einstein! It’s 3.14. Pi Day. And Einstein’s birthday. And we’ll be celebrating around here shortly. This is a re-post from 2013, because this year’s pie is still in the mixing bowl, and-anyway, I already used up all my vast physics knowledge last year. Ya’ll have a great pi day! Wes is a billion floors down in the atomic, molecular, optical physics lab at Kansas State U. where he shoots electrons with a laser and then makes up stuff about why they land where they land. Evidently he’s busy, so I will just fill in the blanks for you about what Einstein had in mind with his equation, that I’ll call “Rik” for short. When Einstein was about 2, he let go of his ball and became obsessed with why it went down instead of up. Or maybe that was Richard Feynman. Anyway, when Einstein was about 9, he was struck out at a little league game because he was preoccupied with calculating the trajectory of the ball as it traveled toward him through the curve of spacetime. He used pi to calculate the curve. Of course. Well, he got benched after that and he had time to think about electromagnetic fields and linear momentum and stuff like that, and some of these things had something to do with pi. And then, as he was spacing out on the bench, his stomach started growling which reminded him about how a particle of pie would be so nice about now. So as he was walking home to get that piece of pie, he whipped up the geodesic equation which expains how if you drop an electron, it will not go straight down, it will go in the straightest possible line on the curve of spacetime and it will end up in Wes’ lab and he will zap it with a laser as soon as he finishes eating his pumpkin pie. I think that about covers it, don’t you? Except for calculating the circumference of a 9-inch pie plate. You do that while I tell you about Mrs. Painter’s winter squash/pumpkin pie. There’s about a one billionth of a percent chance that Asheville will see another snow event like last week’s anytime soon, but it is February, after all, and anything’s possible in these mountains. 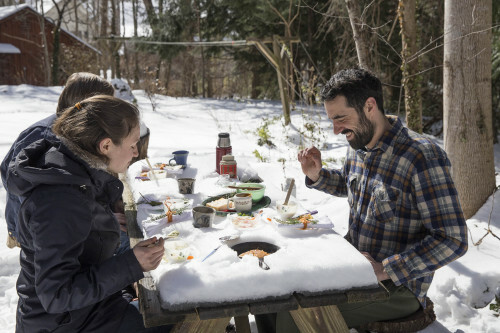 Just in case, I want you to be ready for a low-fuss wintery picnic with your adventurous friends next time you get a snow. The snow-topped picnic table was just hollering “PARTY TIME!! !”, so party we did on a sort of a moment’s notice. I found the makins for 2%-milk-of-celery soup, which is a good soup, by the way, for a thermos picnic because it pours so evenly. 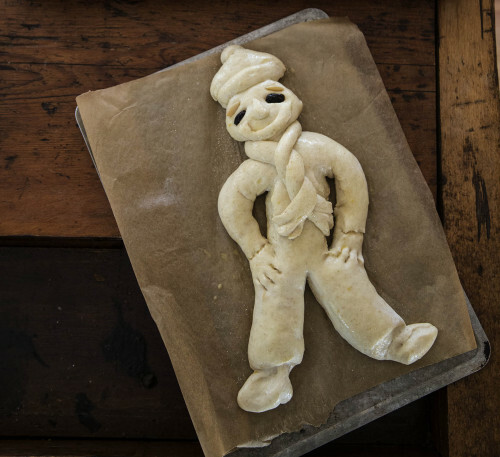 It’s beatnik Santa bread time. 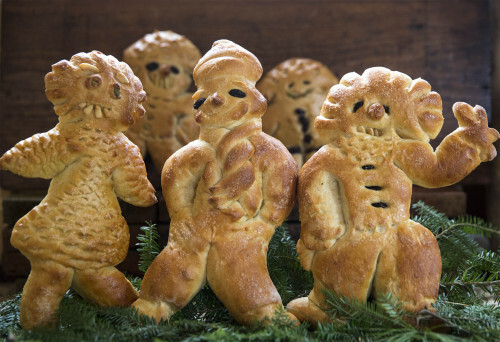 What started out two years ago as a wholesome gathering of friends just celebrating the German tradition of making St. Nicholas Day breads, has turned into an annual holiday doughboy mutiny. But, you see, there are raisins and nuts and seeds that are meant to be used for buttons and such. I have a story that is so profound, that I’m afraid it will be diminished by the telling of it. So I’ve been hoarding it. And to be honest, this is nothing new because my career/life’s work was all about being a repository for people’s profound stories. So many tales of suffering, triumph, and resolve invariably ended with the need to make the world a better place for the learning of some malignant and often unjust lesson. I was a family therapist, and those tales are not mine to tell, but as it turns out, I have a little piece of one to share from those who want it told. It’s about being thankful. 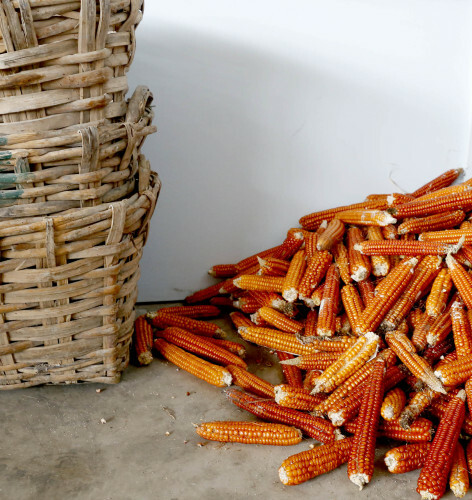 It all started with corn. Italian corn. 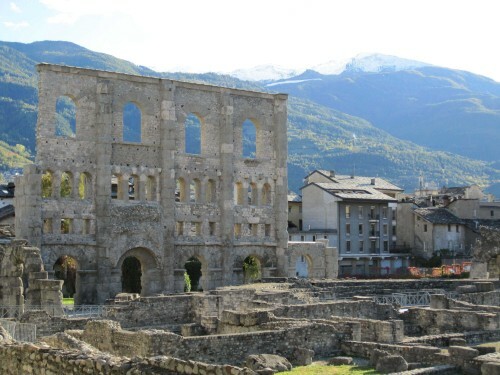 Just a month ago, I returned from visiting our daughter, Annie, who lives in the Italian Alpine town of Aosta. You can read her story here. 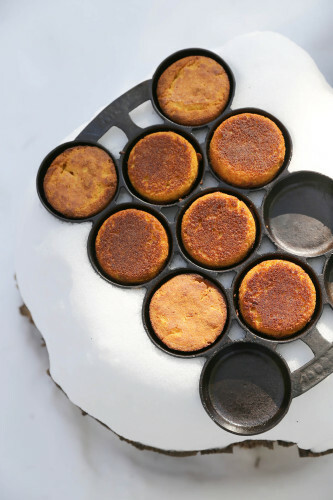 Anyway, Annie’s obsessed with polenta as much as a human can be. 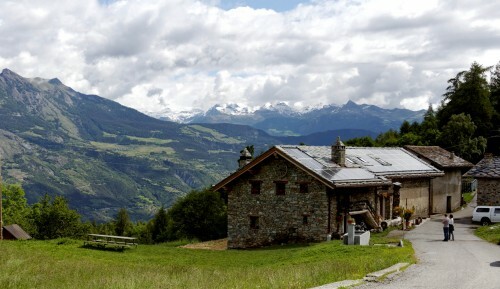 So when I visited her in October, we went on a two week long polenta adventure across the far northern mountains and piemonte region. We called on antique corn experts, met with university academics, chatted with farmers & visited farms, ancient mills, and rural museums. 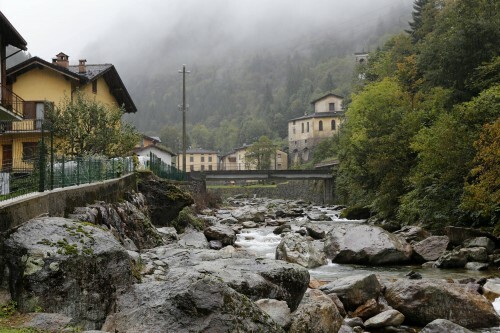 There were Polenta sagre (festivals), a corn-husking party, lots of wine drinking, and accidental driving on blood-curdling half-lane gravel Alpine roads accompanied by screaming and cursing.